The question is…how many of us know, what real vitamin C is? We do however, know rather easily if its vitamin C when it’s straight from your garden. Many vitamin supplements and almost all vitamin (so-called C serums and creams claim they have real vitamin C in their products), but the truth is, it’s not real vitamin C but rather ascorbic acid. Below is a great article that explains what both really are and the differences between the two. “After you’re finished with it, you will know more about vitamins than 95% of clinical nutritionists, doctors, supplement sales force, or bodybuilders. Ok, so here is the deal: ascorbic acid is not vitamin C. Alpha tocopherol is not vitamin E. Retinoic acid is not vitamin A. And so on through the other vitamins. Vast sums of money have been expended to make these myths part of Conventional Wisdom. OK, natural vs. synthetic. Let’s start with Vitamin C. Most sources equate vitamin C with ascorbic acid, as though they were the same thing. They’re not. Ascorbic acid is an isolate, a fraction, a distillate of naturally occurring vitamin C. In addition to ascorbic acid, vitamin C must include rutin, bioflavonoids, Factor K, Factor J, Factor P, Tyrosinase, Ascorbinogen, and other components. In addition, mineral co-factors must be available in proper amounts. Over 90% of ascorbic acid in this country is manufactured at a facility in Nutley, New Jersey, owned by Hoffman-LaRoche, one of the world’s biggest drug manufacturers (1 800 526 0189). Here ascorbic acid is made from a process involving cornstarch and volatile acids. Most U.S. vitamin companies then buy the bulk ascorbic acid from this single facility. After that, marketing takes over. Each company makes its own labels, its own claims, and its own formulations, each one claiming to have the superior form of vitamin C, even though it all came from the same place, and it’s really not vitamin C at all. From the outset, it is crucial to understand the difference between vitamins and vitamin activity. The vitamin is the biochemical complex. Vitamin activity means the actual biological and cellular changes that take place when the stage is set for the vitamin complex to act. Amazing as it may sound if you’re hearing this for the first time, vitamins are more than the synthetic fractions we are commonly taught they are. The ascorbic acid you buy at the grocery store every few weeks, thinking you are buying Vitamin C, is just a chemical copy of naturally occurring ascorbic acid, which itself is still only a fraction of the actual Vitamin C. Real vitamin C is part of something living, and as such, can impart life. Your synthetic, fractionated chemical ascorbic acid never grew in the ground, never saw the light of day, never was alive or part of anything alive. It’s a chemical, a cornstarch derivative, a sulfuric acid by-product. In your body it’s just another drug. Synthetic vitamins have toxic effects from mega-doses and actually can increase the white blood cell count. Vitamins are only necessary in minute quantities on a daily basis. Whole food vitamins, by contrast, are not toxic since the vitamin is complexed in its integral working form, and requires nothing from the body, and triggers no immune response. We find that there is less than 20 mg of ascorbic acid in a potato. Yet this small amount, since it is complexed in a food source, is all the body needs not only to prevent scurvy, but also to cure it, even in its advanced state. Such a remedy is described in detail in Richard Dana’s amazing journal Two Years Before the Mast, written in 1840. Ascorbic acid simply cannot confer vitamin activity, as taught by the discoverer of vitamin C himself, another Nobel Prize laureate, Dr. Albert Szent-Georgi. – tyrosinase as an essential enzyme for enhancing white blood cell effectiveness. Ascorbic acid is just the antioxidant outer shell – the protector of all these other synergists so that they will be able to perform their individual functions. Dr. Royal Lee’s phrase “biological wheels within wheels” always comes up in any discussion of whole food vitamins. Essentially it means that individual synergists cannot function as a vitamin in a chemically isolated form, like ascorbic acid. Vitamins are living complexes which contribute to other higher living complexes – like cell repair, collagen manufacture, and maintenance of blood circulation. Ascorbic acid is not a living complex. It is a copy of a part of a living complex known as vitamin C. Ascorbic acid is a fractionated, crystalline isolate of vitamin C.
Why are you a high school graduate or a college graduate or a doctor, and you don’t know this? Because drug manufacturers like things clean and simple and cheap to produce. To this simple fact add the politics which always comes into play when anyone mentions the word “billions,” and you are beginning to get the idea about where to begin your investigation. Most vitamins cannot be made by the body. They must be taken in as food. The best sources then are obviously whole foods, rich in vitamins. Because of soil depletion, mineral depletion, pesticides, air pollution, and erosion, it is common knowledge that foods grown in American soil today have only a fraction of the nutrient value of 50 years ago. That means a fraction of the vitamins and minerals necessary for normal human cell function. Vitamins and minerals are not functionally separable. They make each other work. Example: vitamin D is necessary for the body to absorb calcium. Copper is necessary for vitamin C activity. And so on. Mineral deficiencies can cause vitamin deficiencies, and vice versa. Epidemic mineral deficiency in America is a well-documented result of systematic soil depletion. So that is the other prime difference between whole food vitamins and synthetics: whole food vitamins contain within them many essential trace minerals necessary for their synergistic operation. Synthetic vitamins contain no trace minerals, relying on, and depleting, the body’s own mineral reserves. And we’re still only talking about people who actually eat raw fruits and vegetables, which is a minority. Processed food composes the majority of what most Americans eat. The only nutrients in most processed foods are “enriched” and “fortified” as described below. I recommend eating real fruits and vegetables from your garden, organic local farms and farmers markets. It’s a start in the right direction. Another way I recommend obtaining higher amounts of vitamin C is through superfoods as they are raw, usually freeze-dried and wild harvested. Below is a good list of foods high in C. So eat way! 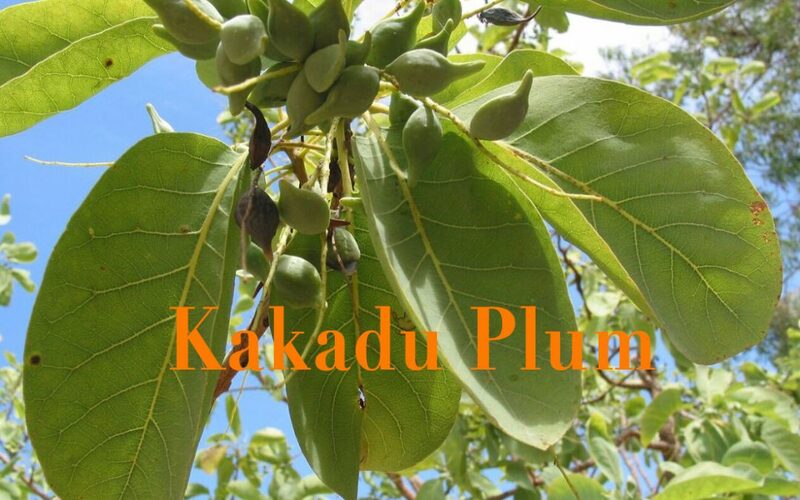 Kakadu Plum (Super-fruit) (highest vitamin C content of any food in the world) Available from projectyoubewell.com, BUSHFOODS brand. Many fresh herbs such as cilantro, chives, thyme, basil, and parsley are high in vitamin C. Buy some fresh herbs and sprinkle on every meal. In fact, just one cup of fresh parsley has over 130 mg of vitamin C. Thyme comes in first, with 160 mg in one cup. Yes there are many more, but I wanted to list a few you can throw in your diet everyday. Dana, Richard — Two Years Before the Mast, p 444 ff. 1840. CDC — National Vital Statistics Report – Vol. 47, no.19, June 1999.